Great Pyrenees Characteristics: The noble and courageous Great Pyrenees is a breed of Giant dog classified as a member of the Working Dog Group (AKC:1933). 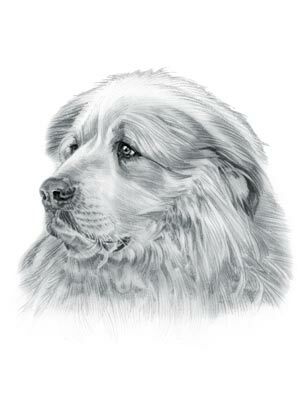 The Great Pyrenees, is characterized by its powerful and imposing appearance with an interesting meditative expression. Other characteristics include dark brown or amber colored eyes that are medium sized and almond shaped; small, triangular ears, rounded at the tips; a thickly coated tapering tail and an effortless gait. The temperament of the Great Pyrenees can be described as Fearless, Patient, Affectionate. The coat type of the Great Pyrenees is described as long, weather resistant coat in white coat color. Due to its characteristics and qualities, the Great Pyrenees demonstrated the desired traits of a Watch dog, Herding and guard dog and is known by its nick name the "Noble's Dog" or simply the "Pyr". The origin of the Great Pyrenees dog breed was in France where it was developed in the Ancient Times. Great Pyrenees Breed Group and Dog Type - Working Dog Group (AKC:1933): The Great Pyrenees is one of the many breeds of dogs that belong to the Working Dog Group (AKC:1933). Other names for the Great Pyrenees: The Great Pyrenees is known by the nickname of the "Pyr" and the "Noble's Dog". Other names for this breed of dog include the Bearhound, the Pyrenean Dog, Pyrenean Mountain Dog, Chien De Montagne Des Pyrenees, Patou and the Chien Des Pyrenees. The term "patou" is derived from the word "pastre", meaning shepherd in old French and used to describe a shepherd's dog. Origin of the name: The origin of the name "Great Pyrenees" derives from the sheer size of the dog and its place of origin in the Pyrenees mountain range that divides France and Spain, stretching from the eastern shores of the Mediterranean Sea to the Bay of Biscay and the eastern shores of the Atlantic Ocean. Great Pyrenees History and Origin: The country of origin of the imposing, snow-colored Great Pyrenees breed was in France and the ancestors of the breed date back to antiquity. The forbears of the Great Pyrenees are believed to have descended from the the massive Molosser types of dogs and the, now extinct, Alaunt breed. These ancient dogs roamed across many countries in Asia and were spread across Europe with the horse soldiers of Attila the Hun (406–453). These ancient dogs were used in the "land of the Huns" and hunting dogs, herders and guard dogs. The dogs reached the Pyrenees and were used by the shepherds to guard their goats, chamois, ibex and sheep against attacks from dangerous predators such as wolves and brown bears. The snow white coats of the Great Pyrenees the shepherd to easily distinguish their dogs from the wolves they might be chasing. Although the Great Pyrenees was initially a peasant's dog it became popular with the French nobility. The Great Pyrenees was described as a "Bearhound" because it was used by French nobles to hunt bear, the eating of bear meat was an aristocratic pleasure. The Great Pyrenees was used as a guard dog, as far back as 1407, at the Chateau fort de Lourdes, strategically located at the entrance to the seven valleys of the Lavedan, in the heart of the Pyrenees. In 1675, they were adopted as the Royal Dog of France by the Dauphin of France who became the Sun King, King Louis XIV (1638 - 1715). The famous explorer John Cabot (c.1450 - 1498) discovered the new, rich fishing grounds of Newfoundland and Basque fishermen took their Great Pyrenees dogs to the new land and the Great Pyrenees became the ancestor of the Newfoundland dog. The Marquis de Lafayette (1757 - 1834), the hero of the French and America revolution, is credited with introducing the Great Pyrenees to the United States in 1824 as a gift to his friend, J.S. Skinner, author of "The Dog and the Sportsman". The Great Pyrenees was officially recognized by the American Kennel Club (AKC) in 1933. Great Pyrenees Modern History: The modern history of the Great Pyrenees moved on and the breed was used as a hauler and a messenger in WW2. The Great Pyrenees is still used as a Watchdog, Guard Dog, Farm worker on French estates and enjoyed as devoted family companion. Great Pyrenees Height: The Great Pyrenees breed is classified as a Giant sized dog. The height to the shoulder of a male dog is 27 - 32 inches (69 - 81 cm). The height to the shoulder of a female dog is 25 - 29 inches (63 - 74 cm). Great Pyrenees Weight: Not surprisingly for a Giant sized dog, the weight of a male dog is 100+ pounds (45 kg). The weight of the smaller female dog is 85+ pounds (38 kg). Great Pyrenees Coat Type: The coat type of the Great Pyrenees is described as a long, weather resistant coat. Great Pyrenees Coat Colors: The colors around the face of this snow-colored dog breed include red, gray and tan. Great Pyrenees Grooming - MODERATE Grooming Needs: The dog grooming needs of the Great Pyrenees is not extensive and therefore categorized as Moderate in order to maintain a healthy coat, reducing the risk of skin infections. The modest grooming needs of the Great Pyrenees is considered to be mid-maintenance requiring weekly brushing and combing. Dog Grooming Requirements should include bathing the dog on a monthly basis and making regular inspections of the teeth, eyes, nails and ears. Great Pyrenees Litter Size: The litter size of the Great Pyrenees dog breed ranges from 6-9 puppies. Great Pyrenees puppies for sale can be obtained reputable breeders and from rescue centers. The cost of Great Pyrenees puppies varies depending on location, pedigree history and the dog breeder. Great Pyrenees Temperament and personality: The temperament and personality of the popular Great Pyrenees dog breed is described as Noble, Fearless, Patient, Affectionate and Courageous. Great Pyrenees Exercise Requirements - HIGH Exercise Requirements: The exercise requirements of this breed of dog is high. The Great Pyrenees requires regular daily exercise consisting of approximately one to two hours each day. This large, powerful dog has a fluid, effortless gait with strides of a moderate length and requires a brisk walking speed or jogging by the owner to meet the dogs exercise requirements. Great Pyrenees Diet: A fully grown Great Pyrenees should be fed twice a day. A diet consisting of a premium dog food can be balanced with fresh food eaten by the family. The question is What Can Dogs Eat?. Check out our comprehensive list of what dogs can and what dogs cannot eat. Great Pyrenees Health Problems: Potential health problems of the Great Pyrenees breed include Patellar Luxation, Hip Dysplasia, Entropion . Resolving health problems can prove to be expensive and it is always wise to obtain pet insurance or dog health insurance when buying a dog. Is the Great Pyrenees dog breed said to be Hypoallergenic? Answer: No. Great Pyrenees Lifespan: The life expectancy of dogs vary according to the size, breed of dog and any serious health problems. The typical lifespan of the Great Pyrenees breed is 10-12 years. Great Pyrenees Male Dog Names: Male Dog names are most often chosen to reflect favorite names of the owner or the strength, size, coloring and country of origin of the Great Pyrenees breed. To give you some inspiration regarding good male Great Pyrenees names our small selection might be of help with naming boy dogs. Our top male dog names are: Brawny *** Mac *** Brutus *** Wookie *** Jumbo *** Muscles *** Trapper *** Duke *** Jupiter *** Genghis *** Ninja *** Ulysses. Great Pyrenees Female Dog Names: Female Dog names tend to be softer, prettier and reflect the temperament of the Great Pyrenees girl dog. Our top choice of good female Great Pyrenees names are Maddy *** Lola *** Honey *** Cassie *** Jada *** Kishi *** Berta *** Maggie *** Gerty *** Hera.